Synopsis: The drug war on the US-Mexico border has escalated as the cartels have begun trafficking terrorists across the US border. To fight the war, federal agent Matt Graver re-teams with the mercurial Alejandro. 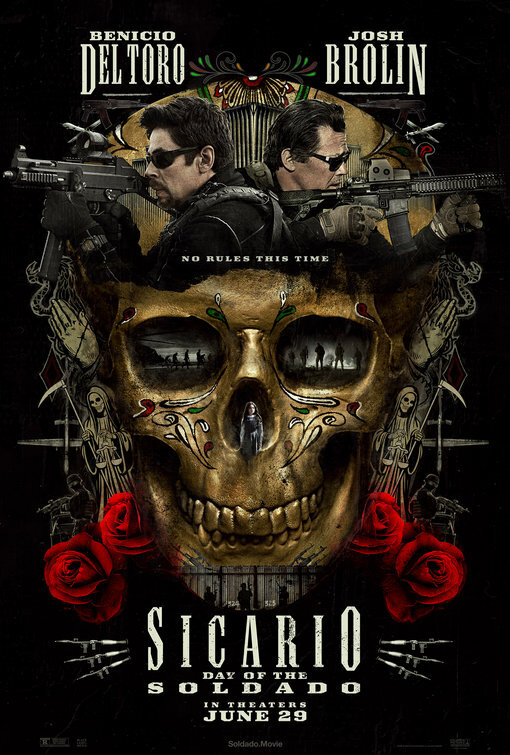 I was fortunate enough to get to watch Sicario: Day of the Soldado – it was still called Sicario 2: Soldado at the time – all the way back in February of this year, but had to sit on my thoughts because of an NDA (Non-Disclosure Agreement). Now, the movie’s out and I can finally release this review. The review will be a combination of my first thoughts watching the movie, and my re-watch from this weekend. So, that said, let’s get to it. Day of the Soldado opens by letting us know that the cartels make big business by trafficking people, and have now moved to terrorists. After a horrifying scene at a department store, the government has put the drug cartels on their list of dangerous threats. They call on someone with some experience in the field in Matt Graver (Josh Brolin) to run an operation on taking them down. 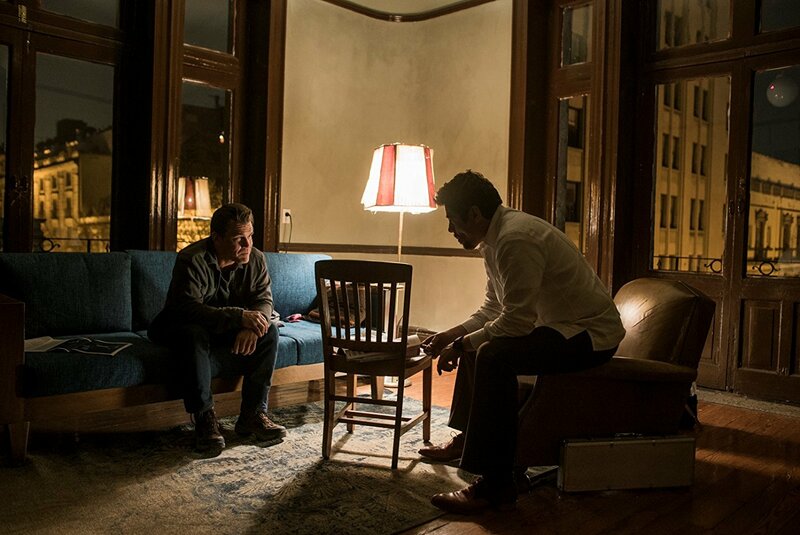 In turn he recruits his old partner Alejandro (Benicio Del Toro) to help him, especially since Alejandro still has anger toward them for killing his family. The mission is to make it look like the cartels are attacking each other, and one of those attempts is kidnapping the daughter of a kingpin, Isabela Reyes (Isabela Moner). Of course, not everything goes as planned. Now, Matt and Alejandro have to figure out how they will survive with all sides closing in on them. 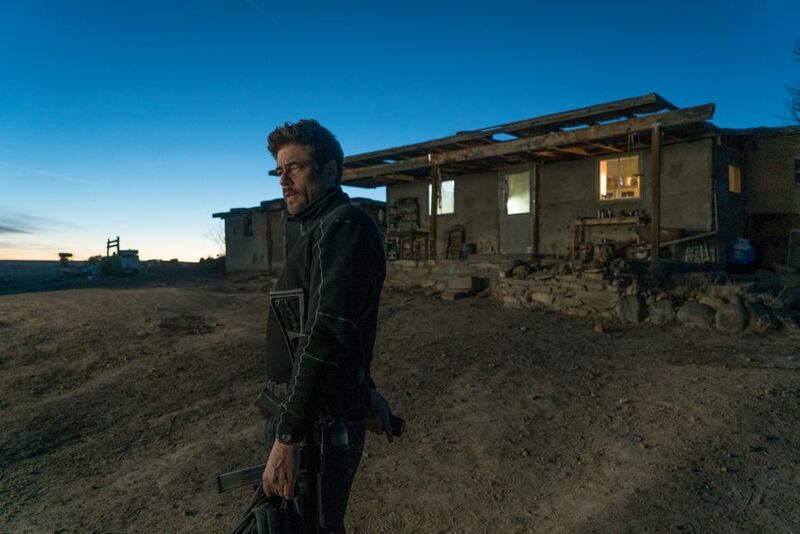 The first Sicario, which came out in 2015, was a surprisingly dark thriller that wasn’t afraid to go there and pushed our expectations on what a movie with this kind of material should be. So when a sequel was announced, many like myself, were eager to see what they would do, and how they would put us back into this world they created in the first film. Now, before we move on, obviously with the real-world issues going on at the border, it will probably be a little hard to watch this, without trying to bring it into the conversation. However, at this point, the conversation feels dated because the real-life issues are more horrifying. But, let’s just move on from that. Unfortunately, Day of the Soldado doesn’t quite live up to the sequel expectations that the film should have had. The film at times feels rather empty, and instead of going for more character development or deeper story points like the first film did, it goes for the easy bloodshed and violence. That’s fine for the world the movie has created, but after watching Sicario, I wanted more of that great character development. Violence is expected in these movies, but I wanted more from the story itself. On top of that, the sequel does feel like a proper sequel. By that I mean, even though the sequel has different people behind the scenes, they tried very hard – and sometimes actually pulled it off – to make you think the sequel was directed by Denis Villeneuve, and the cinematography was done by Roger Deakins. Of course, that’s not the case with the movie being directed by Stefano Sollima and the cinematography was done by Dairusz Wolski (Prometheus, Alien: Covenant, All the Money in the World). The score, which is great, was done by Hildur Guonadottir, who actually worked on the first film’s score and on films like The Revenant and Arrival. He builds off the amazing score that was done by the late Johann Johannsson, who sadly passed away between the films. Thankfully, the cast is solid to make the missteps worth it. Brolin gets a bigger role in the sequel, and gets to play around with the character a lot more. Benicio Del Toro as Alejandro is once again great to watch, and how he engages with Isabela Moner’s Isabela and others – which aren’t many by the way – is good, but none of them are really like the Emily Blunt character from Sicario. Moner is fine as Isabela who knows what her father does, and uses it sometimes, but is still a young girl caught up in a bad situation. Everyone else like the returning Jeffrey Donovan as Graver’s other right-hand man, Steve Forsing, is a welcome sight, Manuel Garcia-Rulfo has a small but effective role, and Matthew Modine and Catherine Keener basically have cameo roles, especially Modine. The only blemish on the cast, for me, is Elijah Rodriguez as Miguel. It’s nothing against Rodriguez and his acting, but rather the character direction or the lack thereof. The movie almost treats Miguel as someone we saw in the first movie, and that’s a problem especially considering where his character ends up at the end of the film. I wouldn’t consider this a spoiler, because it’s known – at least online – that after the success of Sicario, the plan was to make the series a trilogy. That’s made very clear with Miguel’s character, but for me, the character and the arc doesn’t feel deserved or developed enough for me to care. All in all, Sicario: Day of the Soldado, for me, wasn’t as good as the first film. While it ups the violence you would expect from this world, it leaves behind the story and characters just a bit. That’s not to say the sequel is a bad movie, because it’s not. There are some standout scenes, and even some shocking scenes that I couldn’t believe they approved. The cast is still great, and while I wasn’t a huge fan of how they left the movie at the end, I would gladly step back into this world when/if a third movie comes out. Voice Cast: Craig T. Nelson, Holly Hunter, Sarah Vowell, Huck Milner, Bob Odenkirk, Catherine Keener, Brad Bird, Michael Bird, Sophia Bush, Samuel L. Jackson, Isabella Rossellini and Jonathan Banks. 14 years, 14 years is how long we’ve waited for the sequel to The Incredibles, and arguably, one of Pixar’s more popular films. Now, as much as we love Pixar, and should never doubt them – expect Cars 2 – the long gap was something to be a tiny bit concerned about. So, was the wait worth it? For the most part, yes, yes it was. 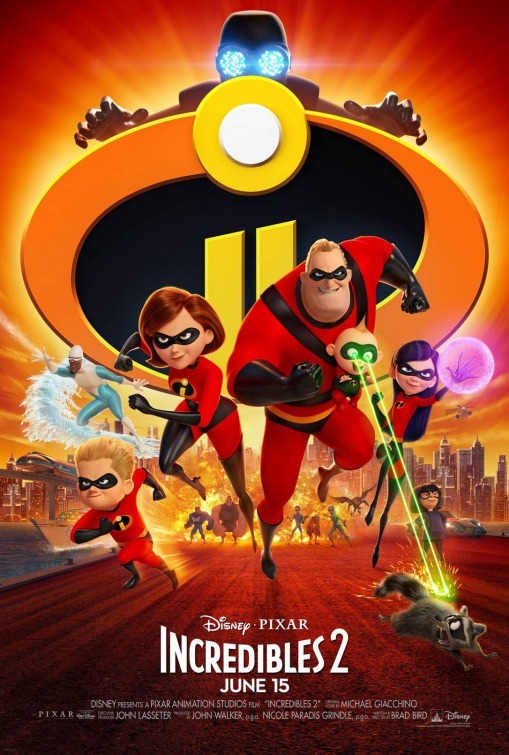 Incredibles 2 picks up immediately where the first film left off, the Underminer attacks the city and we see the Parr family try to stop him before he wrecks the city. However, things don’t go as planned and the already ban on Supers doesn’t get any better. Enter charismatic billionaire Winston Deavor (Bob Odenkirk) and his sister Evelyn (Catherine Keener), who want to bring Supers back into the spotlight. Winston’s power move is to start with Elastigirl/Helen (Holly Hunter) – as Mr. Incredible/Bob (Craig T. Nelson) is seen as a more destructive – to get Supers legalized again. This leaves Bob to be the stay-at-home dad and watch over their kids Dash (Huck Milner), Violet (Sarah Vowell) and baby Jack-Jack, whose powers are starting to kick in. Of course, let’s add in a new supervillain going by The Screenslaver entering the picture causing havoc throughout the city. Incredibles 2 does a lot of things that work on a story and theme level. On a story level, giving the spotlight to Elastigirl, which I’m sure most will see as part of the changing tide in the industry, is awesome. We get to see her let loose, and she is given the most exciting and thrilling action sequence with her cool motorcycle. On that end, we see the roles reversed and have Bob/Mr. Incredible staying at home having to deal with their superpowered kids and a baby in what is both funny and relateable. Not only that, Bob now has to deal with not being a superhero, even though that’s the thing he loves. So the Incredibles 2 not only deals with role-reversals, but also teaching the younger audience about pride and sacrifice. Of course, that will go over kids’ heads but it’s nice to see Pixar trying to deliver that message. Let’s get to the other characters. Jack-Jack easily steals the whole movie by not just being adorable, and using his newly developed powers. Violet gets a subplot with a boy and Dash, arguably, comes off as a tad annoying, but that’s the character. Frozone, voiced again by Samuel L. Jackson, doesn’t do too much, and Brad Bird once again voices Edna Mode (E) in a nice little bit part. The new characters do okay with Sophia Bush voicing a Super named Voyd, who happens to be a fan of Elastigirl, Bob Odenkirk can play charismatic characters in his sleep by now and Catherine Keener as Evelyn was a nice surprise. All in all, Incredibles 2 was, for me and many others from the looks of it, worth the wait. The animated sequel has some great action, a great story and a hell of a lot of fun and funny. The only complaint I think I would side with, to some extent, is it picks up right after the first movie, and doesn’t do a time jump. However, that said, after seeing the movie and having time to simmer with the movie, I’m okay with it not time-jumping. I’ll admit out front, I’m a huge fan of Steven Soderbergh’s Ocean’s Eleven. Ocean’s Twelve was forgettable and Ocean’s Thirteen was a nice return to form, so when the word broke that a spinoff was in the works within the same world, I was cautiously optimistic. Then it was announced that it would be female-centric, and the cast got together I was fully on-board. 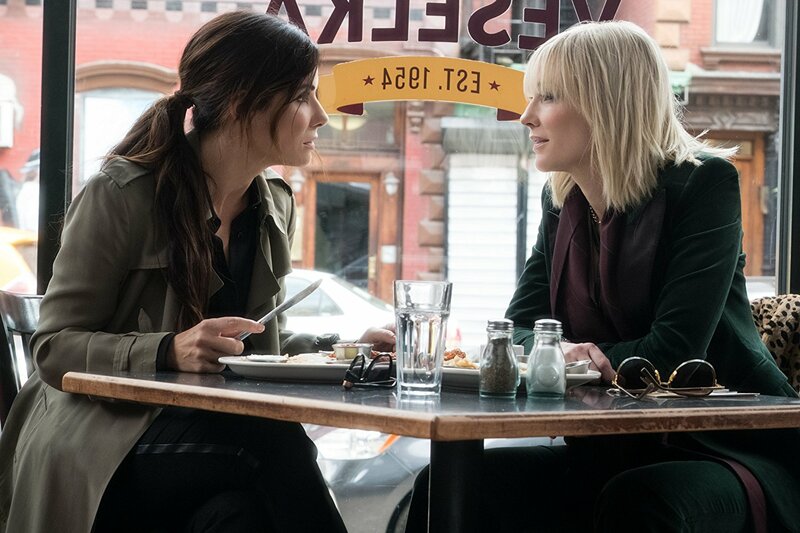 So, is Ocean’s 8 a worthy companion, or is it a misfire? 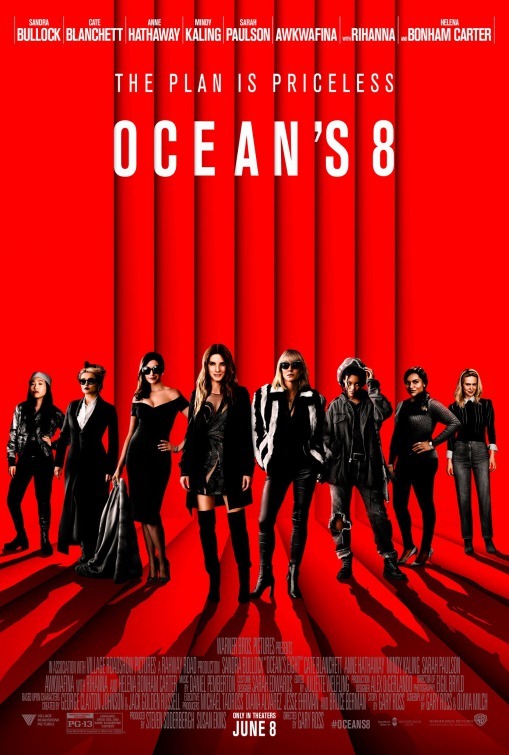 Ocean’s 8 starts off with Debbie Ocean (Sandra Bullock), the sister of George Clooney’s Danny Ocean, who is getting out of prison after serving a five year sentence. Even though she puts out the front that she wants to live the “simple life,” she immediately sets a plan in motion to steal a diamond necklace called The Toussaint at the Met Gala. She begins to enlist her team in her old partner-in-crime Lou (Cate Blanchett), jeweler Amita (Mindy Kailing), hacker Eight Ball (Rihanna), who ends up being called Nine Ball by Debbie and the team, pickpocket Constance (Awkwafina), a “fence” in Tammy (Sarah Paulson) and fashion designer Rose Weil (Helena Bonham Carter). Why a fashion designer? Because, Debbie’s plan is to put the Toussaint on actress Daphne Kluger (Anne Hathaway) while she attends the Met Gala in order to actually steal it. Right off the bat, you know how Debbie Ocean works, and how good she really is at conning people. We also get right into it what the movie will be about. Director Gary Ross doesn’t waste too much time getting the team together and putting the plan into motion. That is both an advantage and disadvantage for the movie. On one hand, you have a fast-paced movie giving you exactly what you want to know before getting to the meaty bit. On the other, it gives you everything you need to know, and sometimes has to fill the void because you don’t want to move too fast. That said, if you’re a fan of Ocean’s Eleven, some beats and even some of the shots, cinematography wise, will feel very familiar to you. Of course, this isn’t directed by Steven Soderbergh, but Gary Ross – although the two are close friends – but Ross is not Soderbergh. However, Ross does put his own stamp on the movie, and doesn’t try to give a movie beat-for-beat, but do his own thing. That’s to be applauded, and the fact that these are all women and not men, is brought up. It’s not preachy or trying to put forward a message, it’s a heist movie that happens to follow women who are good at conning people. That’s it. Speaking of that, the cast is great here, and all of them have their chance to shine. Of course, Sandra Bullock gets the most screen time here, and she does a great job playing the leader here. Cate Blanchett seems to be enjoying her very loose and highly fashionable Lou and Sarah Paulson’s Tammy is a mom running cons on the side in a funny way. The standouts of the cast are Anne Hathaway, who basically plays a characterization of what real people probably think she acts like, and surprisingly, James Corden stands out as a character that comes in near the end, and brings some laughs. Unfortunately, even though the rest of the cast do get a chance to shine, not everyone is really fully developed or given a chance to shine more. Awkwafina gets lost in the shuffle, Mindy Kaling is fine but given her job, you’d think she’d have more to. 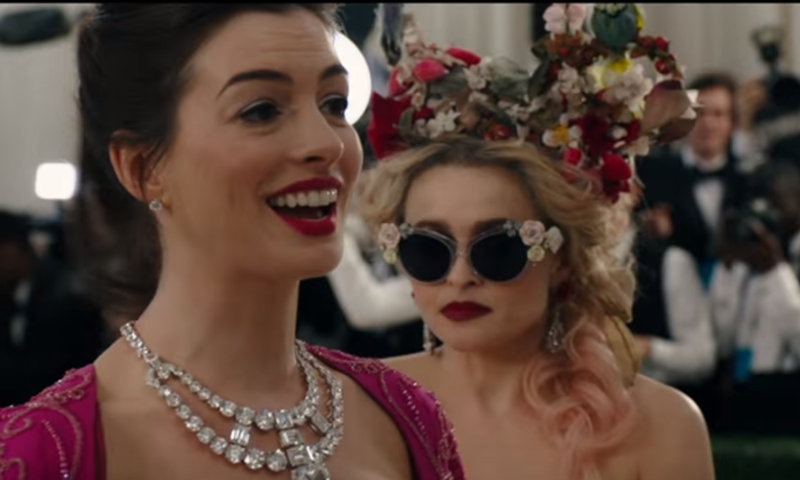 Rihanna and Helena Bonham Carter are good too, but I would have personally like to see more of them – it’s also nice to see Helena Bonham Carter play a normal person for a change. All in all, Ocean’s 8 is a fun and worthwhile companion movie to Ocean’s Eleven. While the movie does have some pacing issues, and the final heist leaves something to be desired, you’ll have fun watching the cast together. Synopsis: When the matriarch of the Graham family passes away her daughter’s family begins to unravel cryptic and increasingly terrifying secrets about their ancestry. A24 as a studio is killing it right now, and when it comes to their horror films, they only have – really – two of them now. The Witch turned a lot of heads and now you have Hereditary. The film also turned a lot of heads, and some are even calling it the best horror film in some time, as well, as a modern day Exorcist. Obviously, those are very big claims to make, and doesn’t help if people are willing to accept that. So, does Hereditary live up to the hype, or is just another independent horror film that is overhyped? 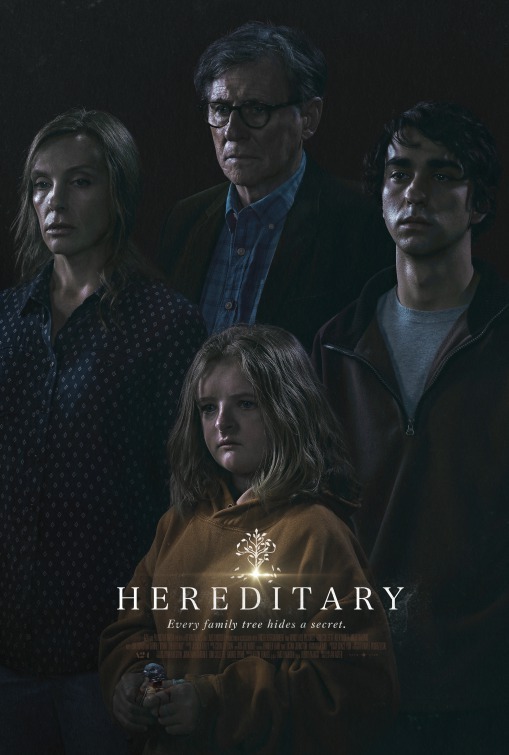 Hereditary follows the Graham family with mother Annie (Toni Collette), father Steve (Gabriel Byrne) and their two children Peter (Alex Wolff) and Charlie (Milly Shapiro). After the death of Annie’s mother, Annie gets lost in her work of miniature sculptures and Charlie starts to exhibit weird behavior. Things only get worse when strange and unexplainable incidents start to occur. That’s the bare bones of Hereditary’s story, and that’s about all you should know before walking into to watch it yourself. Hereditary truly works when you know nothing about the movie. Even if you’ve seen the trailers, believe me, it doesn’t give away anything about the movie. That being said, even though the movie is marketed as a horror movie, at the end of the day, Hereditary is a family drama through-and-through. All credit goes to first time feature film director/writer Ari Aster, who crafted a compelling story about this family and adding horror elements that actually make sense to the history of the characters, and aren’t thrown in for the sake of having a scare or making the film creepy for audiences. There is enough of that to go around, but in this particular film, the scares are connected to the Graham family. We get a great sense of why the characters act like they do, and more important, what has led them to where they are now. 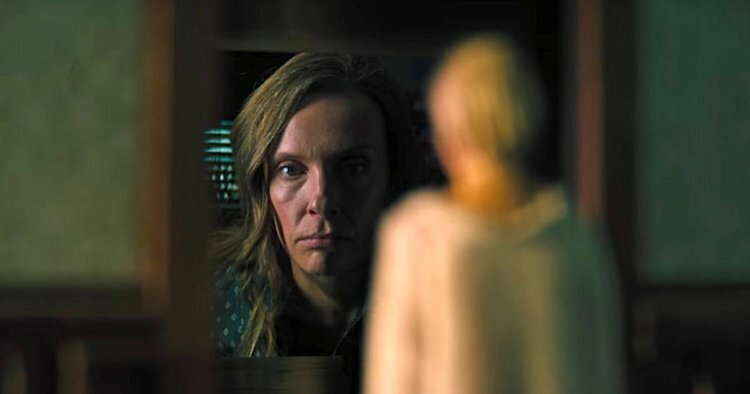 But as much credit Aster should get, Hereditary is carried by Toni Collette. She is put through the ringer here, and she carries it in stride. Her performance as Annie and the slow descent she goes through in the movie is amazing to watch, and one of the standout performances of the year by far. Alex Wolff is also given a breakout performance here as the young son, who also goes through his own mental descent, and newcomer Milly Shapiro as Charlie also breaks out in her own way as the younger Graham family member. 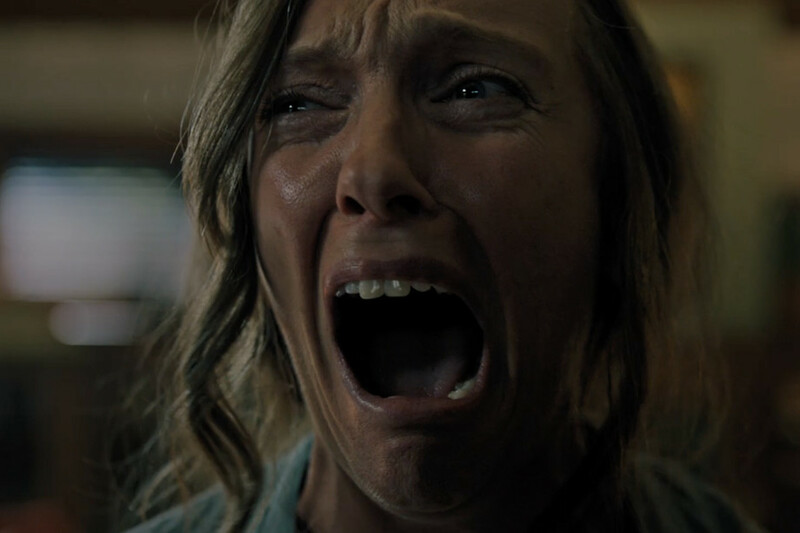 The main thing about Hereditary, much like a lot of independent horror films now, is that it will not be for everyone. 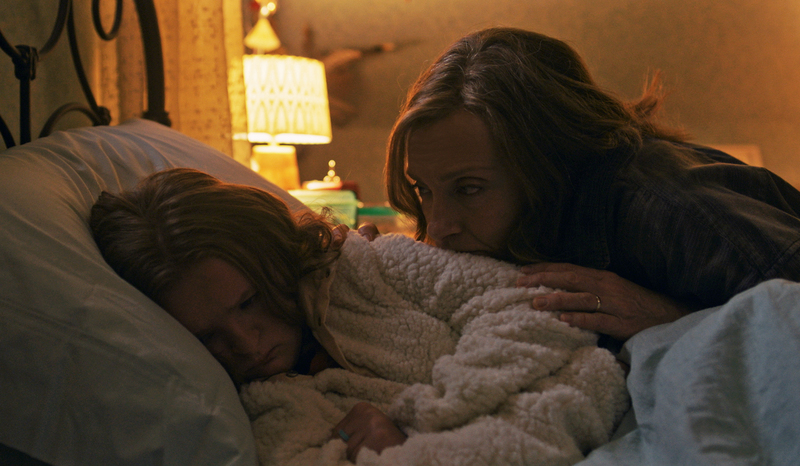 Hereditary, like The Witch and even It Comes at Night, is an aggressive slow-burn that will test your patience, and then reward you with nightmare fuel in a grand finale. That said, the family drama keeps you invested – hopefully – but the slow burn will likely keep people from being fully invested, and once the third act kicks in, it might be too late. 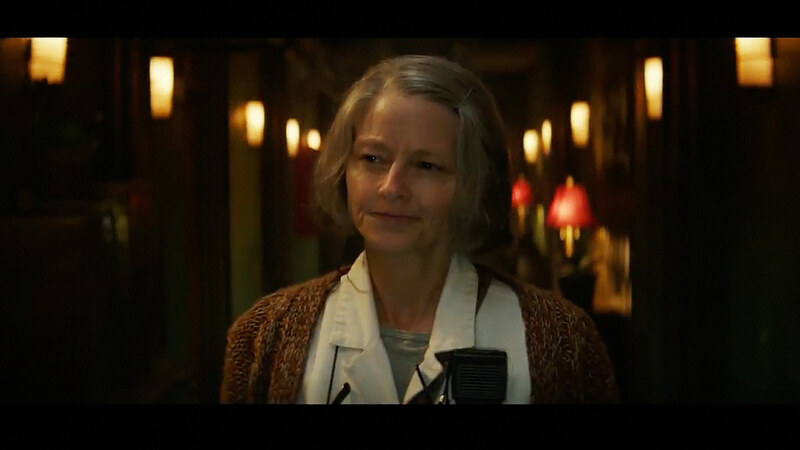 Synopsis: Set in riot-turn, near-future Los Angeles, ‘Hotel Artemis’ follows the Nurse, who runs a secret, members-only emergency room for criminals. Hotel Artemis, the directorial debut of Iron Man 3 co-writer Drew Pearce, has been on my radar since it was announced. Sure the movie drew comparisons to John Wick right off the bat, so the question was what was the movie going to do to stand out? Well, Hotel Artemis does do enough to make it stand on its own, but unlike its spiritual counterpart – for the lack of a better phrase – Hotel Artemis would rather build up the tension for a grand finale. Set in Los Angeles in 2028, the city is rioting over the lack of water, but during all of that, two brothers (Sterling K. Brown and Brian Tyree Henry) pull off a bank heist that doesn’t go as planned. After Henry’s character gets injured, Brown’s character takes him to the Hotel Artemis, a secret, members-only emergency room for criminals to go to get patched up and lay low. There, they met The Nurse (Jodie Foster), who runs the establishment with her head of security, Everest (Dave Bautista). The Nurse gives everyone there nicknames according to their rooms; Brown gets Waikiki, while Henry gets Honolulu. As Waikiki’s brother gets patched up, we meet other occupants of Hotel Artemis in a loud and foul-mouthed businessman Acapulco (Charlie Day), the French assassin Nice (Sofia Boutella), and a cop played by Jenny Slate. Things look to be going smoothly until The Wolf King (Jeff Goldblum) enters the picture, and things go to hell pretty fast from there. 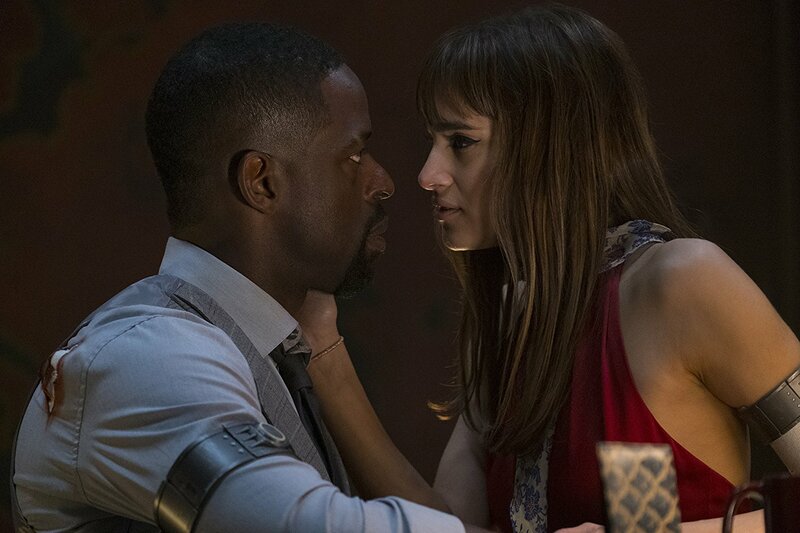 While the trailers and TV spots focus on the action in Hotel Artemis, you’ll be surprised – maybe disappointed if you were absolutely looking for that – that Pearce shows a lot of restraint and keeps the action to a minimal until the very end. What Pearce does instead is build up these characters and world before unleashing the action scenes, which is actually kind of refreshing. Also, the fact that Pearce was able to get a cast like this on his first feature is quite the coup. Everyone nails their roles to a tee. Jodie Foster, despite being behind-the-camera for years now, reminds us why she was such a great actress. The Nurse is the most fleshed out character out of everyone, reaching every emotion available, and while he’s not as colorful as other characters like Day’s Acapulco, her character doesn’t lend to that anyway. Sterling K. Brown’s Waikiki is a man with a plan for everything, and more level-head than anyone involved including his mess-up for a brother. Sofia Boutella’s Nice is arguably the most dangerous of them all, and has a history with Waikiki that sadly doesn’t play out the way Pearce probably intended it when he wrote the script. Dave Bautista’s Everest is what you’d expect from a Dave Bautista role by now, and that’s okay in my book. Charlie Day looks to be having some fun with his role, but it doesn’t quite click for me. Finally, Jeff Goldblum’s The Wolf King, the man that runs L.A., is really nothing more, sadly, than a glorified cameo. And while his short time on screen is great, it does lead to some important events for the rest of the movie. 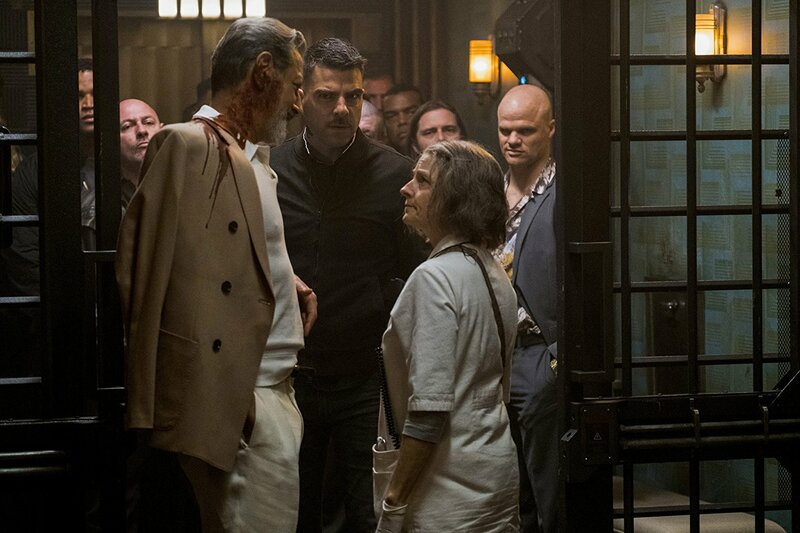 Another thing that sets Hotel Artemis apart from other similar movies – yes it does have some sequel bait/world building – is the impressive production design by Ramsey Avery. We are told by The Nurse, that she has worked for the Artemis for twenty-two years. The halls and rooms look old, but some way they look like a room you’d find in nice hotel. Combine that with the cinematography by Chung-hoon Chung, who did It, and you got yourself a great looking movie. All in all, Hotel Artemis is a solid action thriller that’s worth your time. What Drew Pearce was able to do with his familiar concept, and what he was able to get from his impressive cast for his first feature is impressive. Despite promotion making you think the movie is a shoot ‘em up action thriller, Hotel Artemis takes you down another road that is actually worth it. With a slow build for a big finale, great character development and fleshed out characters, and great production design and cinematography, Hotel Artemis is something to check it out, and something I wouldn’t mind seeing a sequel to. It was a big weeks for movies news, so bare with my on this long and massive podcast. The crime drama follows four young men who mistakenly think their lives are a movie and attempt one of the most audacious heists in U.S. history. The cast includes Evan Peters, Blake Jenner, Barry Beoghan, Jared Abrahamson, Ann Dowd and Udo Kier. A daredevil (Johnny Knoxville) designs and operates his own theme park with his friends. If you’re missing the Jackass in your life, it looks like Action Point will be a valuable replacement with Knoxville pulling out some crazy stunts here. Based on the true story of survival, a young couple’s – Tami Oldham and Richard Sharp – chance encounter leads them first to love, and then on the adventure of a lifetime as they face one of the most catastrophic hurricanes in recorded history. Shailene Woodley and Sam Claflin star. Written and directed Leigh Whannell (the first three Saw films, the Insidious series), set in the near-future, technology controls nearly all aspects of life. But when Grey (Logan Marshall-Green), a self-identified technophobe, has his world turned upside down, his only hope for revenge is an experimental computer chip implant called Stem. Limited Release: Won’t You Be My Neighbor? When the matriarch of the Graham family, passes away, her daughter’s family begins to unravel cryptic and increasingly terrifying secrets about their ancestry. The more they discover, the more they find themselves trying to outrun the sinister fate they seem to have inherited as it slowly destroys everything they know. A24 is quickly becoming, if not already, a powerhouse in Hollywood, and when it comes to the horror genre, they are ones to look out for. With The Witch helping them out, Hereditary looks like another great addition for them. Hereditary stars Toni Collette, Alex Wolff, Ann Dowd, Milly Shapiro and Gabriel Byrne. A spinoff of the Steven Soderbergh Ocean’s movies, Debbie Ocean (Sandra Bullock) gathers a crew to attempt an impossible heist at New York’s City’s yearly Met Gala. I’m a fan of the Soderbergh Ocean movies, expect you Ocean’s 12, so when I heard about the spinoff, I was optimistic, and then the cast started getting together and I become excited. It also helps that the movie looks pretty good. Ocean’s 8 co-stars Cate Blanchett, Sarah Paulson, Mindy Kaling, Rihanna, Awkwafina, Helena Bonham Carter, James Corden, Ricard Armitage and Anne Hathaway. Written and directed by Drew Pearce (Iron Man 3) – who is making his directorial debut – set in riot-torn, near-future Los Angeles, Hotel Artemis is a secret, members-only emergency room for criminals that is run by The Nurse (Jodie Foster). 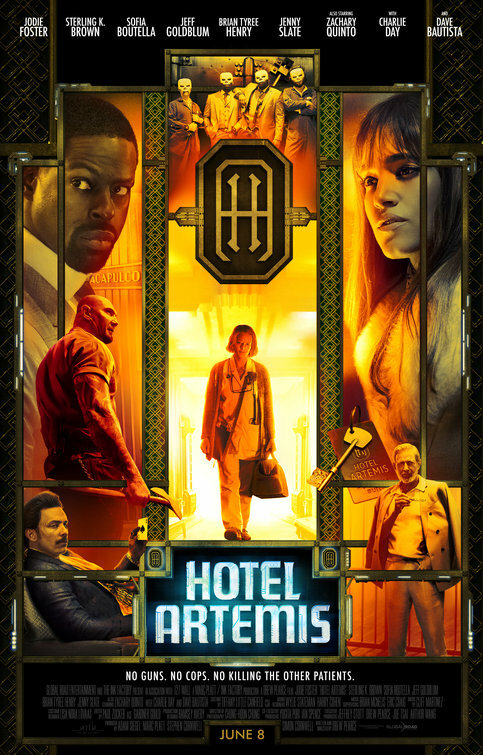 One night, after a heist gone wrong, the Hotel Artemis comes under attack. This was something I’ve been following since it was reported, and now getting to see it on the big screen is great. It also kinda looks like something out of the 80s or even early 90s, which could end up being a nice touch. The impressive cast includes Sterling K. Brown, Brian Tyree Henry, Dave Bautista, Sofia Boutella, Charlie Day, Jenny Slate, Zachary Quinto and Jeff Goldblum. A remake of the 1972 blaxploitation film of the same name, Superfly follows Youngblood Priest (Trevor Jackson), a dealer who wants to score one last big score before he leaves the life for good. However, that’s easier said than done. The movie is directed by Director X, a famed music video director whose done videos for Usher, Nelly, Rihanna, Iggy Azalea and Drake. It clearly shows as it looks like a music video from the trailers, but overall the movie isn’t really doing anything for me. The movie co-stars Jason Mitchell, Lex Scott Davis, Omar Chaparro, Jennifer Morrison, Big Boi and Michael Kenneth Williams. Based on the incredibly true story of a small group of former classmates that organizes an elaborate, annual game of tag that requires some to travel all over the country. When I first read about this becoming a movie, I was eager to see how they would approach this and how they would bring in to play these people. Of course, that was after I said, “really?” but then the cast started coming together, and I watched the trailer I was surprisingly hooked. Tag stars Ed Helms, Jake Johnson, Jon Hamm, Isla Fisher, Hannibal Buress, Annabelle Wallis, Leslie Bibb, Rashida Jones and Jeremy Renner. Bob Parr (Mr. Incredible) is left to care for Jack-Jack while Helen (Elastigirl) is out saving the world. The long-awaited sequel is finally here and well, let’s hope it’s worth the wait. The voice cast includes Craig T. Nelson, Holly Hunter, Samuel L. Jackson, Bob Odenkirk, Jonathan Banks, Catherine Keener, Brad Bird, Huck Milner, Sarah Vowell, Sophia Bush and Isabella Rossellini. When the island’s dormant volcano begins roaring to life, Owen (Chris Pratt) and Claire (Bryce Dallas Howard) mount a campaign to rescue the remaining dinosaurs from this extinction-level event. However, later trailers should us that humans just can’t help themselves, and saving the dinosaurs was just a ploy to sell them off. I know some weren’t impressed with the first Jurassic World, but I was a fan of what they did, and was eager to see what they’d do with the sequel. The promises of Fallen Kingdom, being a darker toned movie look to be true, and I can’t wait to see that in all its glory on the big screen. The film co-stars Justice Smith, Daniella Pineda, Rafe Spall, Toby Jones, Ted Levine, BD Wong, James Cromwell and Jeff Goldblum. After draining his life savings to enter a team in the Rucker Classic street ball tournament in Harlem, Dax (Lil Rel Howery) is dealt a series of unfortunate setbacks, including losing his team to his longtime rival (Nick Kroll). Desperate to win the tournament and the cash prize, Dax stumbles upon the man, the myth, the legend UNCLE DREW (NBA star Kyrie Irving) and convinces him to return to the court one more time. The two men embark on a road trip to round up Drew’s old basketball squad (Shaquille O’Neal, Chris Webber, Reggie Miller, Nate Robinson, and Lisa Leslie) and prove that a group of septuagenarians can still win the big one. Uncle Drew also stars J.B. Smoove, Erica Ash, Lisa Leslie and Tiffany Haddish. The drug war on the US-Mexico border has escalated as the cartels have begun trafficking terrorist across the US border. To fight the war, federal agent Matt Graver (Josh Brolin) re-teams with the mercurial Alejandro (Benicio del Toro). I actually saw the sequel earlier this year at a special early screening, so I’ve been sitting on my thoughts for a while (NDA’s man). However, now that the movie comes out this month, I’m pretty sure I’m in the clear to say that while the sequel had some great moments, I found the first film a little more superior that this one. Day of the Soldado also stars Isabela Moner, Jeffrey Donovan, Manuel Garcia-Rulfo, Matthew Modine and Catherine Keener.